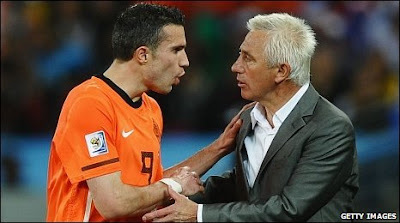 Netherlands coach Bert van Marwijk called a team meeting after reports in the Dutch media claimed Arsenal striker Robin van Persie said midfielder Wesley Sneijder should have been substituted instead of him in their last 16 win over Slovakia. "I will never accept anything that could upset the next match," Van Marwijk told Dutch national broadcaster NOS. "I spoke to Robin and he is supposed to have said something about Wesley. "I've spoken to Wesley and after that I called the team together... told them what I think and then drew a line under it." Ghana goalkeeper Richard Kingson is desperate for a chance to prove himself in the Premier League. Kingson was released by Wigan in May after two years at the DW Stadium, where he made four first-team appearances. "I have to prove myself in the Premier League. It is an unfulfilled mission for me," said the 32-year-old. "I was waiting for my chance and it did not come. Now I am at the World Cup. I am playing, I am comfortable and I am happy. Everyone can see what I can do. "I would still like to stay in England because I know I could play every week in the Premier League." The newly-renovated Christ the Redeemer statue in Rio de Janeiro, Brazil was lit up by green and yellow lights to show support for the nation's football team ahead of their quarter-final clash with the Netherlands on Friday. Legendary Brazil striker Pele has continued his war of words with Argentina coach Diego Maradona. Having previously said Maradona only took the Argentina job because he needed the money, Pele has criticised Maradona's lifestyle. "Maradona is not a good coach, because he had a bizarre lifestyle which cannot go down well with his team," three-time World Cup winner Pele told German magazine 11Freunde.